Rounded neckline high waisted design,Casual Mini Printed Vest Dresses,casual style,slim fit. Mainly Material:Cotton ,Super comfortable and soft,good elasticity Perfect for pregnancy,casual,wedding,vacation,streetwear,cocktail,daily life. 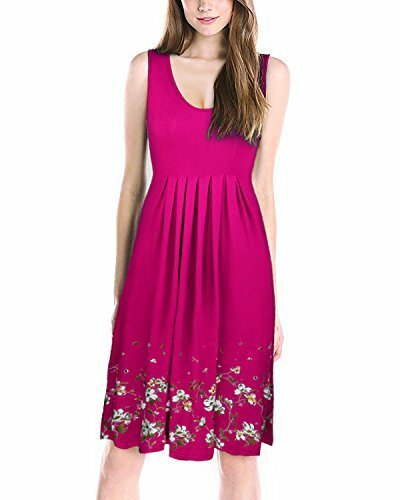 The simple sleeveless mini tank dresses with a solid colors and casual style designs,Round neck sleeveless dress, and high waist with pleated sets off your breast well. You can wear it for just about any even! It's so easy to dress up or down with jewelry and shoes. 2.Please refer to size chart under the Product Description before ordering. Hope you have a pleasant shopping experience in KILIG! If you have any questions about this product by KILIG, contact us by completing and submitting the form below. If you are looking for a specif part number, please include it with your message.